Tourists and travelers simply love documenting their trips through taking amazing photos of the places they visit. Except sharing them on Facebook and Instagram, photos of our travels make for great souvenirs and keepsakes for our family and friends that go beyond words. However, you should try to be unique and avoid your photos getting lost in the crowd of other photos. After all, how many travel photos are out there? To help you create the most beautiful images possible, we’re bringing you five essential tips to master the art of a good travel photo. Before launching into taking photos, ensure that you have the best outdoor camera possible. You don’t want blurry, low-quality, wonky photos. Even more, if you want to immortalize the night sky, you will need special equipment like a camera for astrophotography. This way, you’ll have the chance to create beautiful images that perfectly depict the majesty of our Universe seen from Earth. It is pretty easy to get caught up in the buzz of the new place and you expect to capture all, but not everything you see is picture worthy. 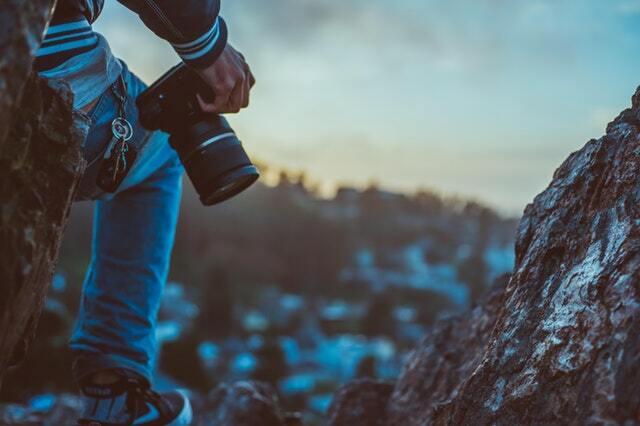 The best times and memories of your travel will be definitely the pictures you don’t take, so for the photos that you do want to take you should know your subject and what will make a photo amazing and likable. The focal point of the shoot should always be your subject, and subject can be divided into three categories, described below. If you want to take a photo of your friend, or a stranger (always ask permission to photograph someone first) you should ask yourself what about this person is memorable? What made you want to photograph this person? Is it their outfit, their smile or the concept of the building that will make your portrait come to life? The Cliffs of Moher, The Alps, Machu Picchu, The Taj Mahal, what do these places have in common? Amazing and incredible majestic views that you don’t want to miss for anything. You want to take a picture of the scene that is in front of you, but how to do it correctly? The pro tip is to include something of a known size, such as a tree, a car or a person in order to accentuate the greatness of the landscape. In this way, your viewers will understand what exactly you were looking at the moment you took the photo. These are great photo opportunities for unique shots. Just imagine the Eiffel Tower at night, it’s a nightscape photo you simply need to have in your travel photo collection. In order to make the best night photos, you should lower your camera exposure, have a steady hand and stand in more lit areas when shooting. No matter what your photos are for, your Instagram profile, your blog, or just to hang them on the wall or store them in your album, having colorful photos will add additional symmetry to your photography collection. Not every photo is nice in black and white, adding a splash of color to your pictures will add them warmth. In order to tell a travel story, plan a theme for your photography before you go on a trip. Is this travel collection going to be all white, in pastels, a pop of color or wearing some significant piece of clothing in every picture? This way you’ll create a creative and fun way to make people interested in seeing your photos. This is one of the most important advice any lifestyle and travel blogger will give, not to mention a professional photographer. It’s called “The rule of third” and means being aware of the focal point of what you’re photographing. Most smartphones today have gridlines in their camera settings, which will give your photos more depth by making them more interesting. When using gridlines, it’s important that you position your camera well and hold the off-center in between the crossroads of the grid you’re using. This way you’ll have a harmonious and balanced composition. Taking outspoken photos of the people makes the essence of every travel moment and is of great worth for your photo collection. Make these photos irreplaceable as they can speak a thousand words about the place you’re visiting. Taking photos of food has become one of the most popular travel photos on Instagram. As much as your family and friends want to know what you are doing in a foreign country, what they really want to see and know is what you’re eating. Be trendy and make them wish by taking photos of your delicious meals. Taking photos of monuments can be pretty boring and you don’t want to have “dead” photos in your collection. You can avoid that by adding the building scale and depth and contrast, this will make your photo a more attractive shot. It’s also useful to carefully observe the surroundings before taking the picture so, if you have some space in your budget for the best compact binoculars we suggest you opt for a pair as it will come handy for sure – if not for monuments, for admiring other views worth of your camera and attention. Even though filtering your photos for Instagram and Snapchat is fun, it’s hard to highlight the photography after you took a photo with a filter on. Keep your hands of filters! No dog filter, no Ludwig, no Valencia! Filtered photos are hard to edit so let the bare pictures tell your travel story. It happens a lot that we take a wide-angle shot, but it’s nothing that can’t be fixed with a couple of clicks. You can crop out everything you don’t like and it works for any type and shape of a photo. High-resolution photos are sharper, better quality and the colors are much brighter. Taking photos in high-resolution will make your pictures less blurry and grainy. If you sharpen photos you’ll get pictures with more textures and highlight lines, structures and shadows of the people, objects or building on the captured photo. Just don’t overdo it. This editing option works well for photos that are taken outside and inside as well. Where your photo needs some lit you can use adding some of the white balance options. Traveling goes by quickly, so when you are visiting a new city, take photos to show the moments and create memories you’ll remember.